Join the Flatt Dog Pound today and help promote Rascal Flatts! The street team participates in "missions" that help spread the word on Flatts releases, events, or awards in order to win amazing prizes. 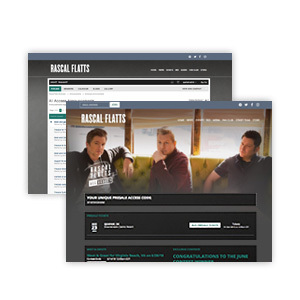 Joining is FREE to anyone who wants to help support Rascal Flatts - so become a member today! *Memberships are good for one year of full access from date of purchase. **You can renew your membership at any time. Any membership purchased before your expiration date will extend your current subscription by 365 days. ***All presale ticket purchases are subject to availability. All shows are subject to cancellation or postponement without notice. Please consult with the relevant venue for seating information prior to purchase and any changes to the show schedule. ****Meet and greets are subject to availability.